Uplifting, astringent and antiseptic. Citronella essential oil is mostly known as an insect repellent, but it has much more to offer in aromatherapy. It is an effective deodorant and also helps to neutralise excessive perspiration due to its astringent action, particularly when blended with cypress oil for personal care blends. Used in skin care Citronella essential oil can help to reduce over-oily skin, and similarly it conditions and balances greasy hair. On the nervous system, citronella is uplifting, refreshing and cleansing, which makes it helpful with lethargy and stress. 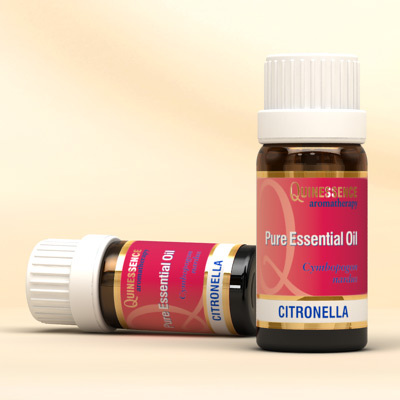 Citronella oil also has antiseptic, antibacterial and antifungal properties, making it useful for bacterial and fungal infections. For extra protection against a wider range of airborne insects, mix Citronella oil with lemon eucalyptus, lemongrass and cedarwood atlas, since these oils also offer effective protection.